In the Midwest, people want to meet their political candidates face to face to shake their hand and to size them up. But if you don’t leave them with information about yourself, memories fade fast, and they may vote for the next person to come to their door. 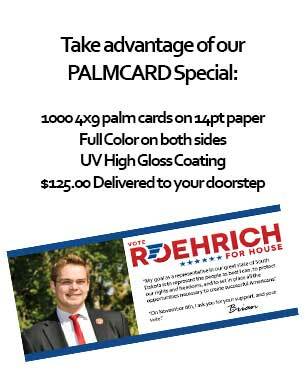 Palm Cards convey the campaign message in a powerful & economical manner, and Dakota Campaign Store prints a lot of them. Call Pat Powers today at (605) 690-6853 or e-mail pat@dakotacampaignstore.com for more information, and to place your order today.